You are here: Home / Podcast / Where to buy supplements? 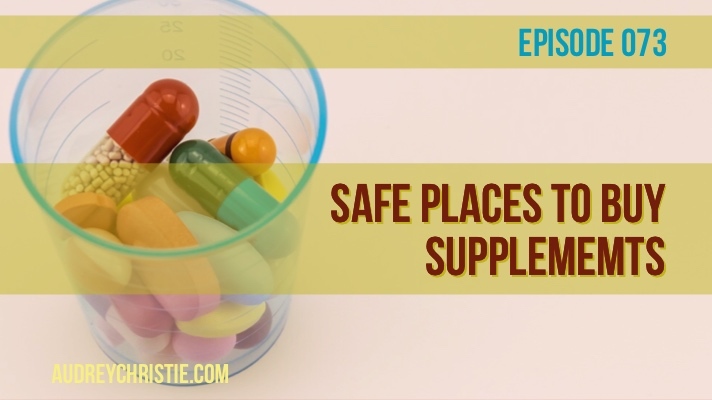 In this episode, you will learn what to watch for when buying supplements and why you should avoid buying supplements from your local grocer or Amazon. subscribe on iTunes and rate us too! Let me preface all of this information with, I love Amazon. Amazon is a widely celebrated and trusted organization, and despite what we are going to talk about today, it does not appear to be actively encouraging these troubles, it just can’t effectively police the problem. In an ideal world, everything we see and buy online would be just what we expected. Never a surprise in the mail or a disappointment when we tear open the package. But in reality, it happens and when we are talking about things we ingest, it can be harder to tell the difference between the real deal and counterfeit products. It’s one of the reasons I began recommending only certain brands of essential oils because it is just too much to risk. I try to recommend exactly what I would do for my own family and think of you, my audience as well as of course my clients, as a family. For years I have been recommending and purchasing my own supplements from Amazon. But it has come to light over the last little bit, that Amazon, although AMAZING, has gotten a little ahead of itself, too big for its britches if you will, and quality control has slipped. This quality control hasn’t slipped once or twice, but about 1 in 4 times. Much of this came to light in early 2018, but Amazon had put in some protective measures to prevent this from happening on the product side - you know hard goods - like shoes and clothes. And added “verified sellers” categories for products including supplements. BUT even the best protections for counterfeit products don’t offer ENOUGH protection when you are talking about what you are putting in your body, especially with the goal of healing or overall wellness. For those of you who regularly visit the Wellness Tools page, you may have noticed that some of the links change frequently, and now this information has switched from Amazon altogether to full script. This is in light of Amazon - still not having it together (and with their business model may never have it together) with their supplement sourcing and regulation. Unfortunately, its just too important to leave to chance. The words “guinea pig” isn’t really something you want to hear when its what you have been putting in your body each day? Or your little body each day? Not to mention spending your hard earned cash on. Don’t let this disturb you out of using natural products though or start rallying for big changes in regulations. This would make the supplement industry like big pharma - where only the deepest pockets survive. It would mean that smaller companies that produce quality products wouldn’t be able to compete and it would take power away from you, the consumer. Should I buy my supplements from my local retail store? I have recommended people buy from retail stores, and still, do occasionally but you have to use discretion. You might think if you purchase your supplements from a big box store like Walgreens, Target, or GNC you’d be safe. You may assume they work to protect their supplement supply chain. Sadly, these stores aren’t immune to the problem. There have been reports that the attorney general has indicated that specifically Target, Walgreens, GNC, and Walmart have sold or are selling “fraudulent and potentially dangerous” supplements. This same information indicated that GNC supplements contained ingredients that weren’t listed on the labels, some inflammatory or even dangerous, like unlisted peanuts and soy. Walgreens ginseng supplement turned out to be only rice and garlic. Several supplements from Target were 3rd party tested and actually tested NEGATIVE for the main ingredient they claimed – and instead contained ingredients of beans, rice, peas, and carrots. Walmart isn’t very surprising, they have a long-standing history of fraudulent food, supplement, and sundry products. We have avoided buying food products from Walmart stores (pet foods included) for well over 5-6 years now. They just are discriminating in their purchasing because of their pricing model. As you can see cheaper isn’t always better, and even if you are getting the real deal, often the amount of the active ingredients per serving in the grocer brands are less than the professional grade supplements. For example - 4 capsules of Costco’s Kirkland brand fish oil equals the same dosage as 1 capsule from the top professional grade fish oils. So you’d have to take 12 capsules per day instead of 3. Unfortunately, you can’t just blindly trust retail stores either. I have since changed my retail recommendations to small stores and independent apothecaries that have an excellent reputation with knowledgeable staff. They do exist, but it does mean adding a trip out of your way. Should I buy my supplements from Amazon? I will say this again, I love Amazon. They make it simple. You have frequently heard me say that if Amazon will bring it to my door, then I am not leaving the house to go shop for it. And that still holds true for me. Amazon is a widely celebrated and trusted organization, and despite what we are going to talk about today, it does not appear to be actively encouraging these troubles, it just can’t effectively police the problem. And your health (and my health) is too important to risk. We only get one of these human suits, ya know? My advice with Amazon supplements has changed in light of all of this information. Should you buy your supplements from Amazon? No. Should I buy my supplements from a friend? I am frequently asked about supplements from X company or Y company. Usually, it is a well-meaning sales representative out there toting their stuff. I get it, and yes, some of those supplement brands that your friend is selling are good, but some of them aren't and most of them aren't therapeutic levels. Meaning, if we are working on something to heal, its quite likely I won't recommend your neighbors patch, pill, or protocol because it might be a good product for someone without any health issues at all (but usually not for someone who truly needs to heal their gut for example). If you are ever wondering if your friends' supplements are truly something that will help you, feel free to ask! I'm always here to point you in the right direction. And a question I get about this a lot is "but Audrey, you work with Young Living?" and yes I do, and I don't recommend any other essential oils. However, I don't exclusively recommend their supplements for example, because for healing protocols, you just need a stronger dose. Clients wellness and healing come first. So what’s a person to do? You want to be as close to the manufacturing SOURCE as possible. Now if I had the time, I would hand source and deliver those products directly from the manufacturer to you, but I don't have the time - nor do I want to get back in the distribution game, because there is so much to keep up with to do it right. But supplements and micronutrients are a BIG part of many of my successful healing protocols and work, so I did some research to find out where I could SAFELY recommend professional grade products for you to buy on your own or be recommended as part of a healing plan with my practice. As a practitioner, I have changed my recommendations on the Wellness Tools from Amazon to a company called FullScript. Here I have created the same resources and recommendations only via a company that operates more like a pharmacy with regulations than a warehouse. And no, this isn't an advertisement for FullScript in general. Fullscript is the only ONLINE outlet that I can give you access to trusted professional grade brand names, sourced directly from the manufacturer. The best part is they AND follow every. single. storage and shipping guideline. For each supplement. They also have 11 independent 3rd party quality certifications. If you want to try it right now, FullScript is allowing me to offer you 10% off retail to you through the month of April (all of my clients get 20% off, so if you are a client - let me know and I can get that set on your account). If you need help on what to buy or replace, I can help. To wrap this up, although we love love Amazon, it's just not a safe place to continue to purchase supplement products (and you should do your due diligence on ALL products purchased) through Amazon and your local grocer. Remember that cheaper isn't always better, and you are often compromising at a minimum quality and typically the amount of the active ingredient per serving, sometimes even compromising with dangerous fillers. Avoid expired, untested, and adulterated products by purchasing as close to the source as possible. My advice is FullScript - they also make it easy on me as a practitioner to recommend supplements in specific doses and categories- but also safe for you.